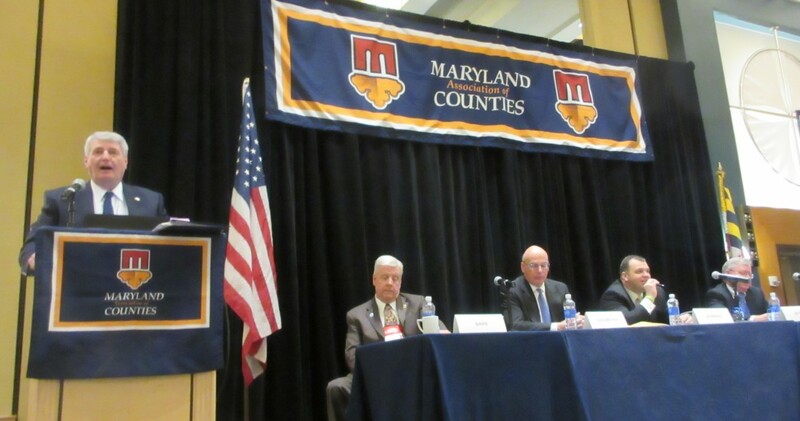 House Speaker Michael Busch addresses Maryland county officials on a panel moderated by new MACo President John Barr, a Washington County commissioner, Sen. Ed Kasemeyer, Sen. J.B. Jennings, and Joe Getty, the governor's chief legislative officer. House Speaker Michael Busch addresses Maryland county officials on a panel moderated by new MACo President John Barr, a Washington County commissioner, Sen. Ed Kasemeyer, Sen. J.B. Jennings, and Joe Getty, the governor’s chief legislative officer. Newly elected Republican Gov. Larry Hogan might be surprised to the learn that the squabbles he had with the Democrat-controlled legislature represented “a honeymoon.” Legislators saw Hogan’s election as a shotgun marriage inflicted by the voters because a poor Democratic suitor failed to woo them. “You’re going to see some veto overrides,” Jennings predicted, likely on the tax on Internet hotel bookings and voting rights for ex-felons. Jennings was on a panel discussing the upcoming legislative session, a standard part of the Maryland Association of Counties annual winter conference at the Cambridge Hyatt Regency. “We have a lot of freshmen ready to spread their wings,” Jennings said. Almost half the legislature now knows where the bathrooms are and how a bill gets passed,. “They’re going to come out fighting for the issues they care about,” Jennings said. “I did not know the honeymoon was over,” Getty said. “We look forward to renewing that cooperative relationship” with the Democratic chairs of the Senate and House budget committees. Getty said the Hogan administration hopes to work out some “mandate relief,” changing some of the formulas in law that now drive 81% of the state budget, despite the governor’s supposed control of spending. “We used to have a very strong executive power over the budget,” Getty said, but that has been eroded by legislative mandates and entitlements, particularly on school aid and health funding. Hogan and staff saw Busch as one of the main reasons major portions of the new administration’s agenda ran into trouble. But at least in his speech to MACo, Busch struck a conciliatory note on education funding and other issues. A potential battle between Democratic lawmakers and Hogan had already been raised on the panel by Sen. Ed Kasemeyer, D-Baltimore-Howard, chair of the Budget and Taxation Committee. He was filling in for Senate President Mike Miller, whose wife had broken her hip. Kasemeyer noted that the Capital Debt Affordability Committee, in a little noticed move, had established the limit on new general obligation bonds at $995 million, $50 million below last year’s debt limit, and it also voted to keep the new debt limit flat for the next five years. Kasemeyer said that would produce $200 million less over that time period, meaning some new projects, such as schools or university buildings, could not be built. This limit had been set at the Sept. 30 meeting of the committee that no reporters attended, to the disappointment of Hogan’s staff and Comptroller Peter Franchot. The committee is chaired by State Treasurer Nancy Kopp and has five members including Kopp, Franchot, Budget Secretary David Brinkley, Transportation Secretary Pete Rahn and longtime public member Paul Meritt. Brinkley proposed the reduction in the debt limit because of the continuing structural deficit and the rising cost of debt service. Kopp, a former Democratic delegate re-elected by the legislature this year to another four-year term as state treasurer, argued against the reduction in the debt limit, but she ultimately lost the vote 4-1. Kopp wanted to maintain the 3% growth established in 1992, according to the committee report. Sixty percent of state debt is spent on schools, universities and community colleges, and Kopp said it was not the committee’s role to cap the debt below the state criteria. Democratic Comptroller Peter Franchot had long opposed increasing the debt as the O’Malley administration had done, partly to finance projects that would have come from designated taxes for open space, bay cleanup and farm preservation that O’Malley used for other purposes. Kasemeyer and the others laid out other issues that will be important in the upcoming 90-day session. Kasemeyer serves on the Augustine Commission, appointed by Busch and Miller to examine the business climate. The commission is struggling to come up with tax cuts that could make Maryland more business friendly, with an emphasis on reducing the personal income taxes on high earners that are some of the highest in the nation. Kasemeyer said reducing such taxes would require coming up with higher taxes and more revenue elsewhere. Kasemeyer also said the legislative staff has determined that Gov. Hogan’s plan to increase highway spending and to return highway user revenues to the counties “really can’t done” with the gas tax revenues coming in. Democrats have continued to push Hogan to release $68 million in school funding known as the Geographic Cost of Education Index. Busch said that issue has been “settled and resolved” for next year. The legislature passed a bill mandating full funding in future years, and Hogan allowed it to become law without his signature because he didn’t want to mount a veto fight that he was likely to lose. Hogan has proposed an extra $5 million funding for school systems in Allegany, Carroll and Garrett counties that had been experiencing lost funding due to declining enrollments.